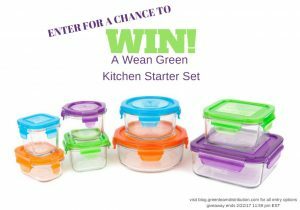 This entry was posted in Blog and tagged Giveaway, green team giveaways, wean green kitchen starter set. Bookmark the permalink. Aveeno lotion is something that I used on my babies. Thanks! There are so many to choose from, but I would love to try the Woohoo wool dryer balls. Have heard great things about them. My favorite baby product is the Love to Dream baby swaddle! I found it with my 2nd and wish I would have had it for my first. It zips up and has “wings” that can be zipped off separately when they are ready to begin transitioning out of the swaddle. One of my all time favorite item for baby/toddler was our sleep sack. Both my kids kick blankets all night, so it was super useful! I’ve always been curious to try something from Buncha Farmer’s! The Buncha Farmer’s Manuka Honey Soap sounds wonderful! Water Wipes are perfect for families with sensitive skin. We have eczema and Water wipes are safe for us and we use them on pacifiers too. There are so many good products I’ve tried for my toddler(s). My most recent favorite discovery is the Nellie’s Wow Stick – it took curry carrot soup out of my daughter’s white dress without much trouble! We use Eco-Nuts everyday when I do laundry. Only thing I trust to wash my clothes. I don’t have a child but I’ll take suggestions!